The Sennheiser PX 360 BT headphones are a high quality product that provide lots of options. They have bluetooth technology, can be recharged using a USB, are noice canceling and comfortable on top of all of that and more! The Sennheiser PX 360 BT headphones definitely have more pros than cons. They are quite versatile for your needs since you can easily switch between Bluetooth and wired connections. The stereo Bluetooth technology provides the hands-free experience along with quality hi-fi sound, and the wired connection is great for conserving the battery when wireless is not needed. It is to be expected that the price is what most people are being held back by, but let me tell you that in today’s world of technology you get what you pay for. Right out of the box you will enjoy the appearance of the headphones themselves. They have a very sleek and attractive design that is easy on the eyes. Looking nice is great and all, but it is the comfort and sound quality that will likely form your opinion of the headset. Fortunately, the looks of the Sennheiser PX 360 BT headphones are followed by both. One of the more important features these days is noise cancellation. We all like to enjoy listening to our audio without having to hear noises from the outside world. The closed around the ear design is perfect for comfortable listening, but also doubles as passive noise reduction. Once you own a headset that provides this quality combo you will never want to go back to the old style of headphones. So how is the sound quality? In one word, it is superb. The sound is crystal clear, whether you are using wired or Bluetooth. There is no loss of quality when using the wireless features! Whether you listen to your music low or want to feel like you are live in concert this particular headset is sure to deliver the quality you desire. It is really an all-in-one package. Basically, you get the comfort you want, high-quality sound, wireless capabilities, and it is extremely easy to travel with. Can you get a pair of headphones cheaper? Definitely. Will they match up to the Sennheiser PX 360 BT headphones? Not a chance. The Sennheiser MM 450 headphones are a high quality product that does come at a high quality price. 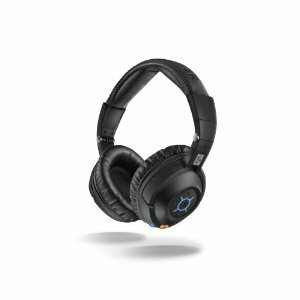 If you are looking for the capability to have a wireless Bluetooth set of headphones with top of the line noise cancellation, these headphones are the choice for you. With rave reviews for their quality, you will definitely get the quality that you pay for. In the electronic age that we live in today, headphones are a must for most people. Whether you use them to play a game on the computer, to listen to music on your mp3 player, or to talk on your cell phone, there are a plethora of uses for headphones. The Sennheiser MM 450 headphones can address all of these needs by purchasing this one product. And what's even better: they are wireless! When you get your box in the mail you will see that the headphones are crafted well and as you try them on you will find that they are comfortable to wear. They have an over the ear design that does not irritate the insides of your ears like ear buds or other options might. The Sennheiser MM 450 comes with the following included in the box: the headphones themselves, a USB cable that can be used when using them on the computer, an audio cable with an in-flight adapter, a wall charger, and a carrying case. Some that have purchased these headphones have complained that the carrying case that comes with the headphones is not up to the standard of the headphones themselves. It is a soft nylon bag that can fit only the headphones and possibly the audio cable, but nothing else. However, there are places that you can purchase a hard case to use with these headphones and have them more protected as you use them. The pending question that most buyers have is does the product deliver on the noise canceling aspect when they are paying such a high ticket price? For most users, that answer is a big yes. With NoiseGard 2.0 technology, the Sennheiser MM 450 cancels noise up to 90 percent! 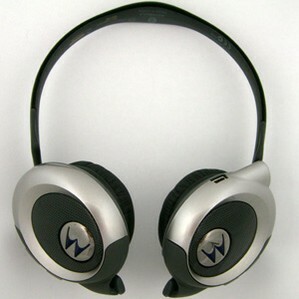 In addition, the headphones have the TalkThrough technology, which allows users to press one button and use the built in microphone while still using the headphones. And you can do all of this with the convenience of Bluetooth 2.1. Use your headphones with the noise cancellation feature for up to 8 hours, or up to 10 hours if you are not using the noise cancellation feature. If you are not in need of the Bluetooth feature, the headphones also come with the cable. The charging time for the battery is approximately three hours. 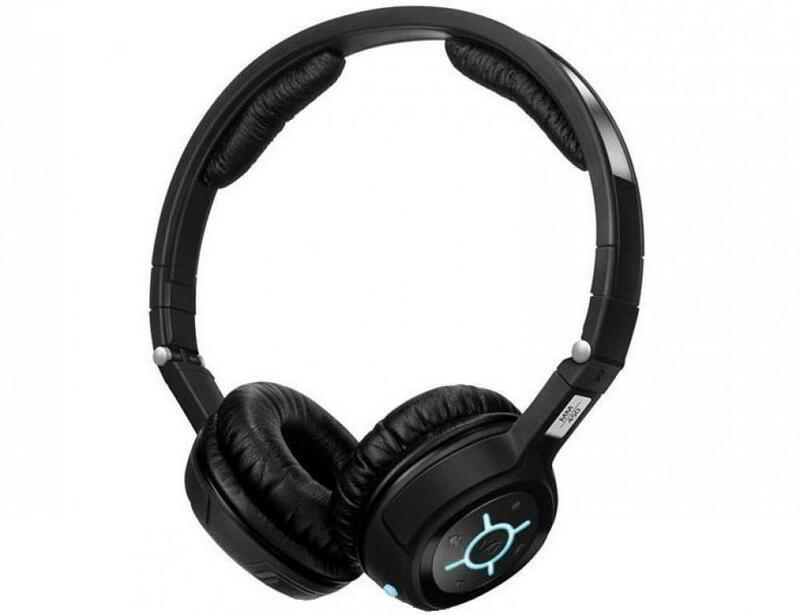 So if you are looking for a high end pair of headphones that offers you a noise free conversation or a great game with friends while talking on a chat server, the Sennheiser MM 450 headphones deliver. The price tag may take you aback at first, but if you look at the reviews you will see that people who have purchased this product as opposed to others do not regret doing so. They are well worth the high price! 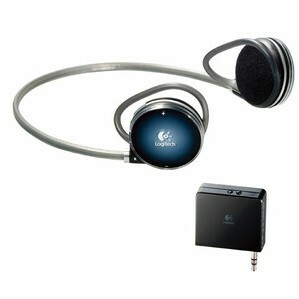 This is a headphone that is incorporated with a Bluetooth feature that works effectively with the notebook or iPad. Additionally, it also supports the iPhone by offering a relatively seamless switch between listening to music and taking or making calls. A notable downside of the Sennheiser MM 550 Noise Cancelling Travel Headphones with Bluetooth is that they don’t provide enough volume. In addition to this, the manual that the device comes with leaves a lot to be desired, as it does not explain things in a simple manner that every one can understand. The Sennheiser MM 550 Noise Cancelling Travel Headphones with Bluetooth is a device that I would recommend to other people. With the Sennheiser MM 550 Headphones, there is a detachable cable that makes the switch from the Bluetooth in a simple automatic manner. This is a feature that makes the headphone to have a relatively easy effect on the airlines. It is charged with the world battery chargers via the USB port. There is another feature which is known as the Talk Through which allows the users to talk through the head Phones and hear what is going on around them. The head phone has been designed to be very comfortable and it cancels noise. The feature is incorporated with the Talk Through in that you can either switch the Noise Cancellation on or off. The quality of the sound is usually much higher when the device is being used in an environment that has minimal noise levels. The quality of sound that the device produces in general is very excellent. This can be heard on the crisp trebles and the booming bass that does not distort all the same. It has been designed using technology that will enable all genres of music to be enjoyed to the same extent. NoiseGard 2.0 noise-canceling technology actively reduces up to 90% of outside noise. Stereo Bluetooth wireless technology delivers hands-free convenience and hi-fi sound. TalkThrough technology: one press of a button activates external microphone. Invisible microphone for taking calls in between play lists and songs. Neodymium magnets and patented Duofol diaphragms deliver excellent sound reproduction. Superb quality transmitted over Bluetooth. Complete noise-cancellation. These headphones are comfortable to wear. The headphones are on the large side, bordering on massive, which means they are a bit hard to carry around. The awesome PXC 450 returns with Bluetooth connectivity. Now you can enjoy superior quality Bluetooth streaming from your PXC 450 BT headphone set. This is the wireless brother of the Sennheiser PXC 450 noise-canceling headphones. It uses Sennheiser's Apt-X codec to transmit the audio data over Bluetooth to from the transmitter to the headphones, which ensures that you get the best quality sound. 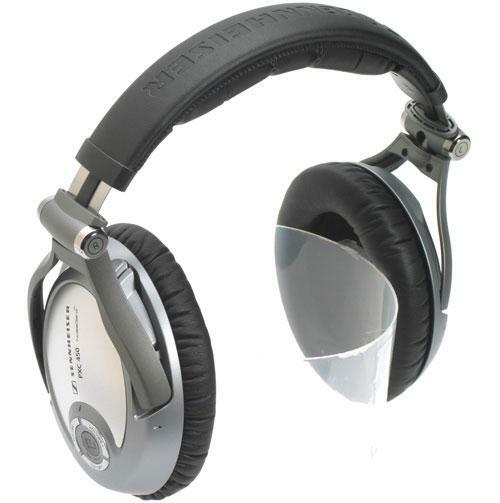 Noise-Canceling features are similar to that of the wired counterpart of the Sennheiser PXC 450 Bluetooth: it uses Sennheiser's NoiseGard 2.0 technology which allows you to turn the noise-canceling feature on or off at the flick of a switch on the right ear cup, which also contains all the other controls such as those for volume. Another cool feature of the Sennheiser PXC 450 Bluetooth is the ability to listen to a conversation without taking the headphones off, thanks to the in-built 'Talk Through' feature, which uses tiny microphones on the headphones to pick up external noise and filter out noise other than the voice of the person you are talking to. Talk Through can be activated at the press of a button. The Sennheiser PXC 450 Bluetooth uses 2 AAA batteries per ear cup for transmission receiving and for the noise-canceling feature. These batteries can be recharged using the transmitter. There is also the possibility of using the headphones without turning on noise-canceling if you want to save juice on the batteries. This headphone set is the perfect solution for anyone looking for headphones that can work using wireless technology while canceling out external noise effectively. Higher quality when it comes to the clarity of the sound and that of the bass. It provides wireless freedom and the Bluetooth technology allows telephone connection. The microphone is not properly functioning and there are often delays at the level of the Bluetooth technology. Also, there are some controls that are not compatible with iPhone. While you get the feeling that you are only using headphones from time to time, the Sennheiser MM 400 Bluetooth headset still makes a great investment for those who long searched for the device that delivers great sound quality. The invisible microphone could have been a major advantage, but the fact that the user encounters problems when using it lowers its practicality. The new Sennheiser MM 400 Bluetooth headsets offer the possibility to both make calls and listen to music. With the help of an integrated invisible microphone, one can easily use MM 400 to talk in a comfortable manner. However, the microphone is full of surprises and this useful feature can become unusable at times. When it comes to how long can the headsets’ user talk, the product offers a talk time of around 20 hours. The product also includes features and controls meant for playing games and watching video on the iPhone. As it is a full of surprises device however, MM 400 comes with difficulties when it comes to these activities too. Sennheiser MM 400 is a great choice for those who travel a lot as it works both wireless or wired, in case of no Bluetooth accessibility. More than that, it can be compacted so that it won’t take too much space when carried. The German company Sennheiser did a good job with this model when it comes to portability, comfort while wearing the device and a great transmission signal, but failed to provide the product with the promised standards in terms of using it for communication. Bluetooth-enabled means no more cables. Long battery life. Call quality is quite good and in stereo. Less likely to get pulled over now on the Turnpike because you are talking on your phone. Nobody on your block is likely to have these yet. More likely to get pulled over on the Turnpike because you look like a Cylon. Hard to get working with some phones. Begin to hurt after about thirty minutes. Expensive. Drop-out issues. The HT280 are not quite ready for primetime. The fit and comfort issues would be easier to accept if this was $29.00. Getting this to work with the appropriate phone was a chore. Motorola HT280 Stereo Bluetooth Wireless Headphones: The Cylons have Arrived Listening to Akon? Bluetooth-enabled stereo headphones dish out the tunes and let you answer incoming calls with a certain…ahem, degree of flare. Laws banning the use of cell phones while you drive have become quite common all over North America, and it is hard to argue with those who claim that most people have enough problems driving, let alone drive and talk on the phone at the same time. As someone who averages seventy-five miles per hour in the right lane, I can tell you that they are dead on in their argument. The wireless Bluetooth headset was a brilliant invention to deal with this problem. I can now drive even faster and talk. That of course created another social problem. The annoying person with the flashing blue light on their ear. I actually know people who wear their Bluetooth headset so much, that it has become part of their anatomy. They would fall asleep with these things still on and pulsating, waiting for that next important phone call, if their families did not object. Don’t you hate people who appear to be talking to you, but are actually talking to someone else on their Bluetooth headset? In theory, the Motorola HT280 is a brilliant idea. Kill two birds with one stone. Take calls from your lawyer and listen to Prince on the same device. The headband on the HT280 reminds me of a good pair of sunglasses I used to wear playing baseball; unless you take long-term comfort and coolness into account. After reading the manual (always a bad move, I know), it took almost twenty attempts before the HT280 would synchronize up with my LG Bluetooth-enabled phone. I bought it because it was designed to work with Motorola Bluetooth headsets, so the connection issues were frustrating. Finally, after getting it to work, I realized that I would have to download some music to my phone before I could hear anything. More money spent. Needless to say, I was not impressed with the set-up of this device. When I did it to work, the HT280 sounded merely okay as a pair of headphones. It felt so awkward on my head, that I took it off after ten minutes. I know that Etymotic has taken some heat for the design of their Bluetooth-enabled headphones, and I think Motorola must have used the same designer. As I was about to pack the entire thing up and take it back, a call came in over the headphones. It has an awesome patented receiver that plugs into any electronic device with a 3.5mm stereo plug, resulting in wireless playback up to 33 feet. It’s also real simple to use. Just charge it up then plug-and-play. The design of the headband is not adjustable. That means that wearing anything around your neck such as a collared shirt or a towel might interfere with the fit of the headphones. Not to mention the ear -rings become awfully uncomfortable to wear after a long period of time. Even more so, these aren’t the headphones that are going to satisfy serious audiophiles. They’re loud, just not extremely loud. Plus, the battery life is also fairly limited, with only a 6 hour playback time before a recharge is needed. Although the Logitech FreePulse Wireless shines when it comes to wireless convenience, the lack of comfort, limited usage time and less than fantastic sound may be enough to deter some users. But if you can withstand these imperfections than the Logitech FreePulse Wireless can become a reasonable buy. The Logitech FreePulse Wireless Headphones gives the luxury of listening to your favorite music without being constricted by a pesky wire. Due to the Bluetooth 2.0 wireless technology, you can wear the Logitech FreePulse Wireless Headphones up to 33 feet away from your electronic device. It even comes equipped with a rechargeable battery that last for up to six hours. For unmatched comfort, it also provides a durable high carbon spring headband as well as custom-fit soft-touch comfort rings. The Logitech FreePulse Wireless Headphone is made to fit all 3.5mm adapters. A cheap Bluetooth earphone set which actually does not kill your listening experience. There is practically no reduction in sound quality as you move away from the Bluetooth transmitter. The remote volume control which is attached to the earphones is somewhat bulky and takes away from the lightweight nature of the earphones. Normally you would experience a lot of problems with bluetooth earphones. However, this little gadget by Sony helps you ease into your listening without having to carry around your music source. The best thing about it is its price. 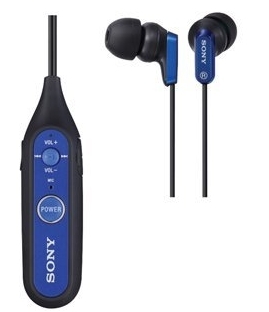 The Sony DR-BT100CX comes at the low price of around $60, and does not show any of the bad functionality shown by other low-budget bluetooth earphone sets. – Check the Current Price of this product. The Sony DR-BT100CX Bluetooth ear bud style Earphone set really gives value for money and makes using a Bluetooth earphone set a true pleasure. Most of the low-budget Bluetooth earphones I have used started to wane in volume and sound quality as soon as I started moving away from the source of the Bluetooth signal. However, the Sony DR-BT100CX didn't lose its sound quality even at a distance of 30 feet from the source. This was truly an amazing experience. The remote volume control that comes with the earphones is attached to the earphones themselves and gives excellent control over what you are listening to. However, it takes away from the small proportions of the earphone, making it slightly bulky. Nevertheless, the ear phones are quite small and fit in the ear nicely, canceling out all external noise, allowing you to enjoy your music to the maximum. The Sony DR-BT100CX is a great choice for anyone who is looking for a good-quality Bluetooth earphone set that can be obtained at a reasonable price. Check Out the Headphone Store Here and Amazon Here.